Just thought I'd jot down a few thoughts and remarks that I have about populating these PCBs. For the most part, the builds have all gone really well. Just a couple of joints that I've had to re-flow, and some minor component issues. My lead bending tool (Mouser 5166-801) is - as always - a lifesaver. Don't ever leave home without one. For soldering, I have a Weller WTCPT with a PTA7 tip. 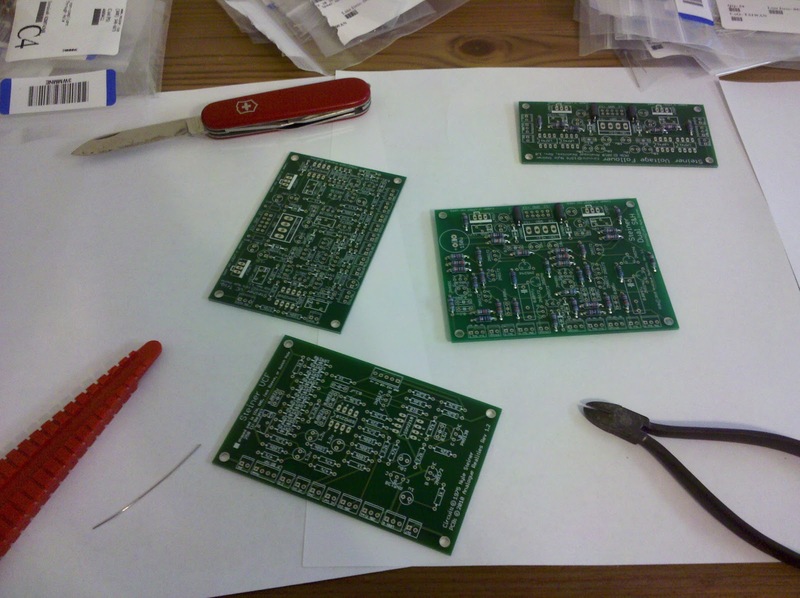 Solder-wise, I am using Kester 331 on the board, and Kester 245 everywhere else (pots, etc.). How I ever survived growing up with those terrible Radio Shack soldering pencils and solder is beyond me. I am so glad I shelled out the cash for this stuff at the beginning of this year. The Kester 331 is water-soluble, so after (nearly) every day of soldering, I wash the board, with distilled water and a toothbrush. The 245 doesn't need cleaning. (I suppose the 331 doesn't absolutely need cleaning either, but it makes it both nicer to look at, and work with. I've also got a desoldering pump (Digikey K412-ND). I don't use it much, but it seems to work fine. There's nothing special about the rest of my tool set! I am waiting on an IC pin straightener from Futurlec, though... it should make inserting the ICs into the sockets a lot nicer... most ICs usually come with the pins at a slight angle... bending them against the table with your fingers isn't ideal. Anyhow, as I mentioned, only a few components are giving me any trouble. And, those are the Murata MLCCs - the fancy, blue ceramic caps. Not sure why I picked these specifically, but they've got bends in the leads so that they sort of snap into the board. Unfortunately, the coating (just around the legs) will sometimes crack when you're putting them in place. (Happens if you try and straighten the leads too.) It doesn't seem to be an issue, electrically... but it is still annoying. I'll probably go with Kemet MLCCs in the future... they're cheaper, too.